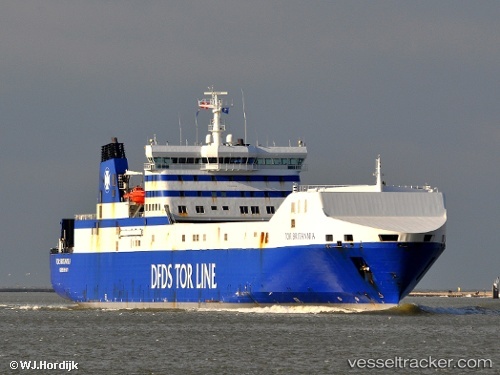 As of the end of November, DFDS will again be increasing the ship capacity on its two freight routes from Rotterdam to the United Kingdom. The reason for this is the continuing growth in freight traffic to the English market, for which DFDS already introduced extra departures in June, the company said in its press release.On the Rotterdam – Felixstowe route, the ANGLIA SEAWAYS will be replaced by the BRITANNIA SEAWAYS. As a result, it will be possible to ship an extra 300 trailers a week. This is in both directions. The change takes effect on 24 November and the ships operating this route will then be: SUECIA SEAWAYS, SELANDIA SEAWAYS and BRITANNIA SEAWAYS. There are daily sailings between Rotterdam and Felixstowe, with six departures a day from Tuesday to Friday. The International Maritime Organization has recognised the courage shown by Captain Andreas Kristensen and his crew in putting out an onboard fire on the DFDS cargo ship Britannia Seaways last November (2013) by bestowing them with an award. Kristensen will travel to London in November to receive the 2014 IMO Award for Exceptional Bravery on behalf of the entire crew. Some 70 nautical miles off the shore of Norway, the 11,000 deadweight tonne ship – carrying 70 tonnes of diesel, as well as aviation fuel and vast quantities of gasoline, reports IMO – caught fire, putting the lives of all 32 crew members at risk. Rescue helicopters arrived at the scene shortly after the fire broke out at 7pm, but they were unable to secure the crew, as the rescue process – which would have involved turning the ship windward – would have intensified the fire. Captain Kristensen made the decision to not evacuate the non-essential personnel from the ship, instead organising his crew to fight a raging fire that was producing flames of up to 30 metres high.